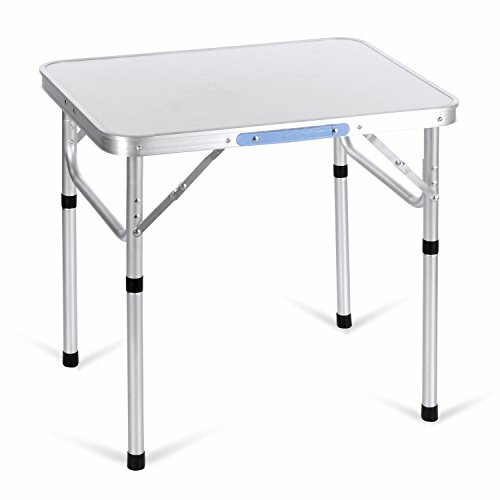 Moroly Aluminum Folding Utility Table is the first choice for you if you are looking for a portable table for party, picnic, camping, tailgating, etc. The table is designed with two different height settings to accommodate your various needs and with a convenient carrying handle so it's easy to tote around. Lightweight with the foldable design makes sure you can enjoy every moment of your outdoor events. The stability of the table is inversely proportional to the height of the table. The lower the height, the more stable the table. The 21-inch setting is perfect for children to use for crafts, playtime, or snack time. The 24-inch setting is ideal for sitting while working on homework or for family game night. The 27-inch setting is designed for snacks During the party, picnic or other projects that require standing. Triangle locking hinge add more support to ensure the stability. Unfolded Dimensions: 23.40 x 17.55 x 9.8/21.5 inch (L x W x H) Two adjustable height settings: 9.8 inch; 21.5 inch. Super Lightweight & & Quickly Clean: Easy to clean with mild soap and a soft-bristled brush. If you have any questions about this product by Moroly, contact us by completing and submitting the form below. If you are looking for a specif part number, please include it with your message.